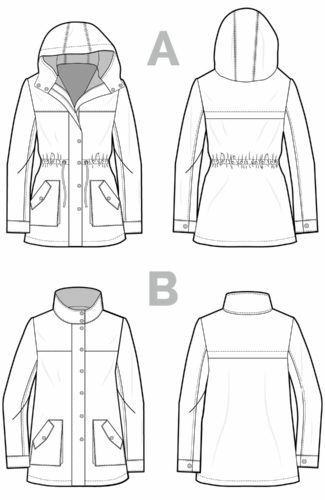 Sewing a fly front zipper is one of those sewing tasks that is often met with trepidation. 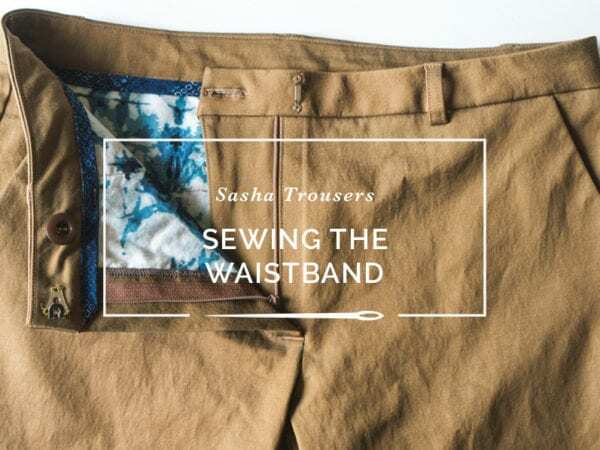 If you’re sewing our Sasha Trousers (or any other pants pattern) this tutorial will walk you through sewing one with absolute ease, I promise. 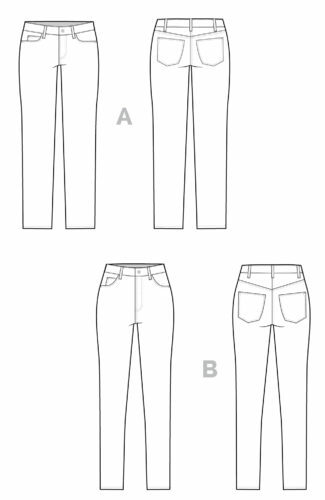 While it’s similar to the method I’ve posted before for our Ginger Jeans, the process is completely opposite; women’s trousers traditionally open from the left side, instead of the right side for jeans. If you are having trouble switching your brain to the other side, or if this is your first time installing a pants zipper, we’ve got you covered here! 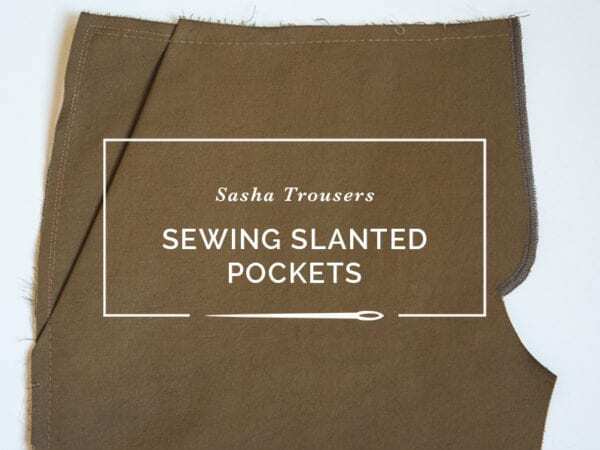 If you are wondering what kind of a zipper to use for your Sasha Trousers, we recommend a regular pants zipper. 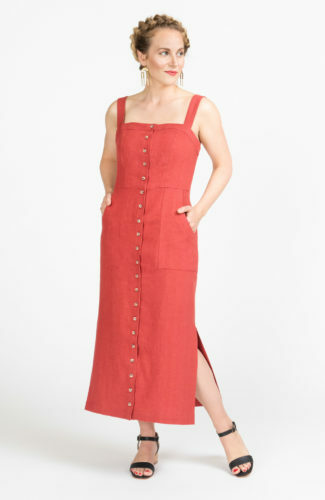 They come in a huge selection of colours so it is easy to find one that will match your fabric choice exactly. 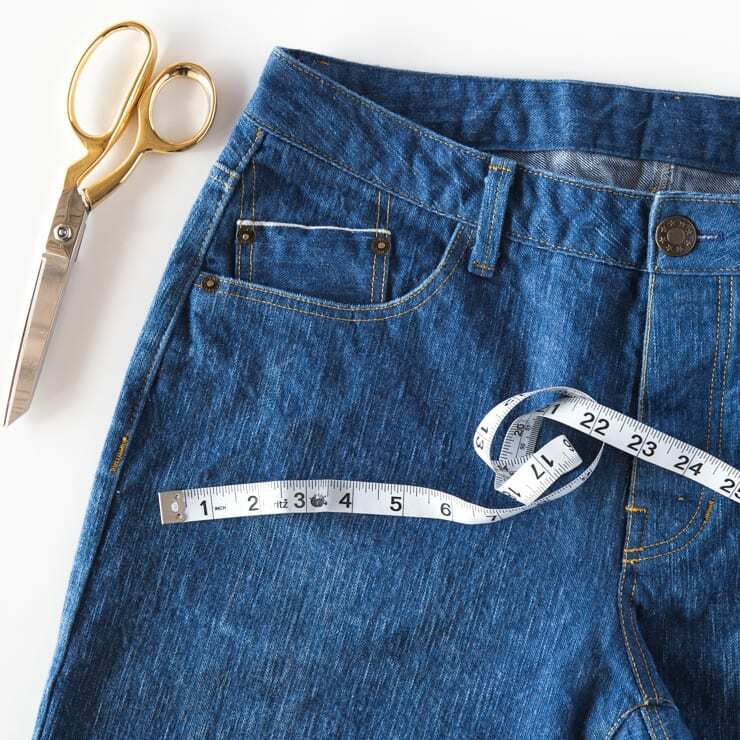 It doesn’t matter if your zipper is a little too long – you can trim it to fit. 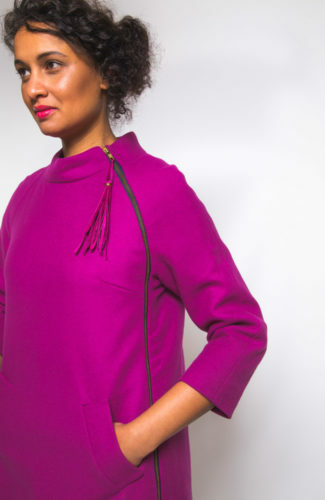 If you aren’t sure if your zipper is long enough for the size you are making, measure your front leg pattern piece along center front from the circle marking to the notch, subtracting your seam allowance. 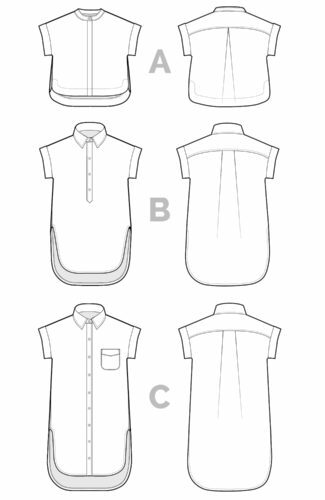 One thing to note: this tutorial demonstrates a fly front zipper when the fly extension is actually drafted to the front pant pattern piece. Many methods call for the fly extension to be sewn to the center front instead, but I think this is needlessly complicated and makes for a longer and less intuitive process. 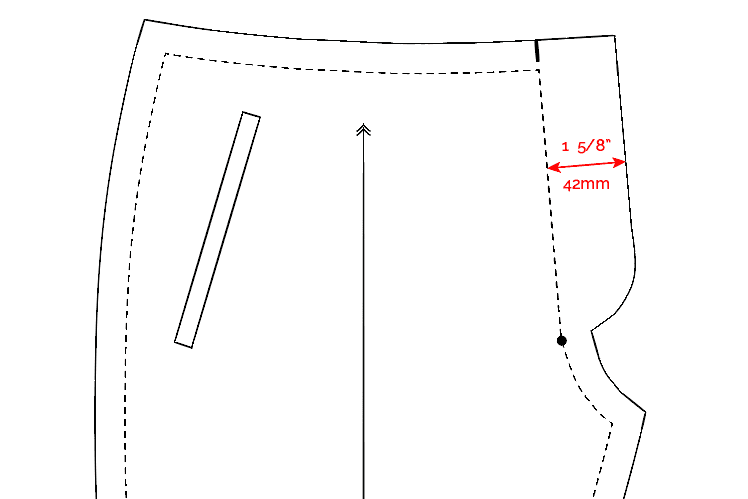 If you are using a pants pattern without this extension, I suggest adding it yourself. Ours is about 1 5/” or 42mm wide parallel to the center front. The bottom of the extension curve starts where the crotch starts to curve out. 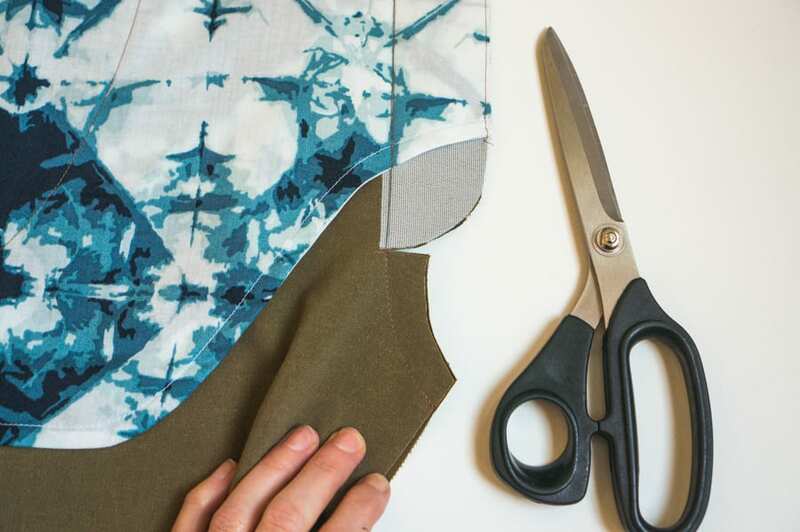 Obviously, you have to do this before you cut your fabric, but it only takes a minute to draft; I do this now to every commercial pants pattern since I dislike sewing fly front zippers without the extension built in. 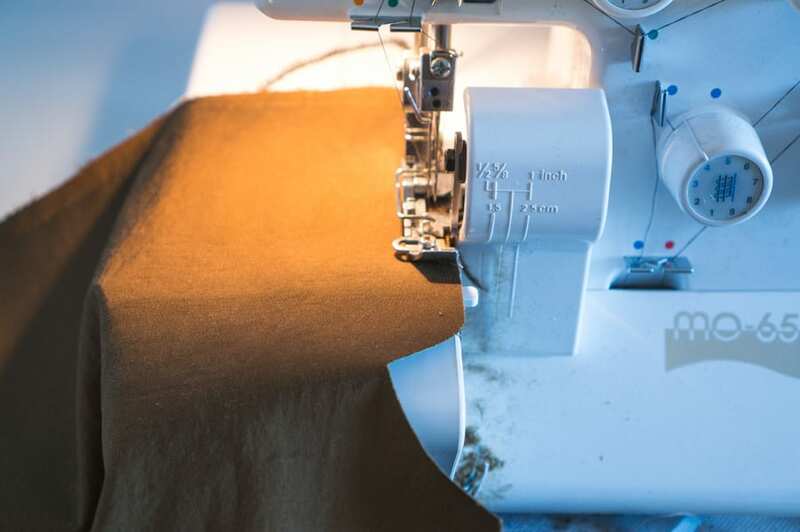 To prepare the front legs for the fly front installation, finish the raw edge of the right front leg’s fly extension with a serged or zig-zag stitch. 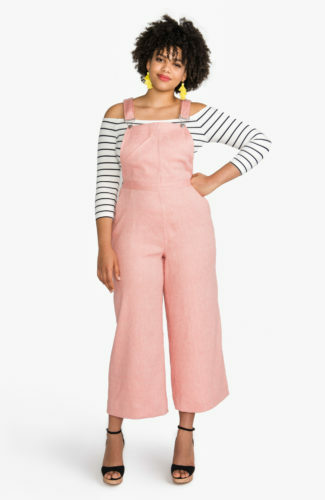 Please note that right and left leg refer to the pants as you are wearing them. 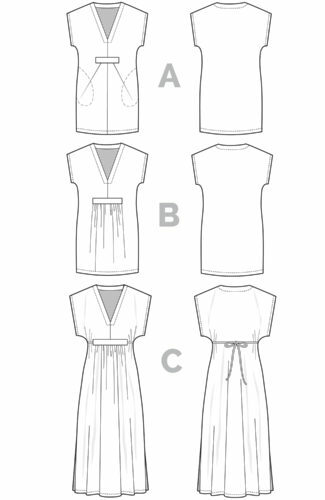 In our instruction booklet, it says to start stitching at the bottom of the extension so you don’t cut into your fabric if you are serging. Here I started sewing from the top of the extension, and folded the leg out of the way when I reached the bottom. 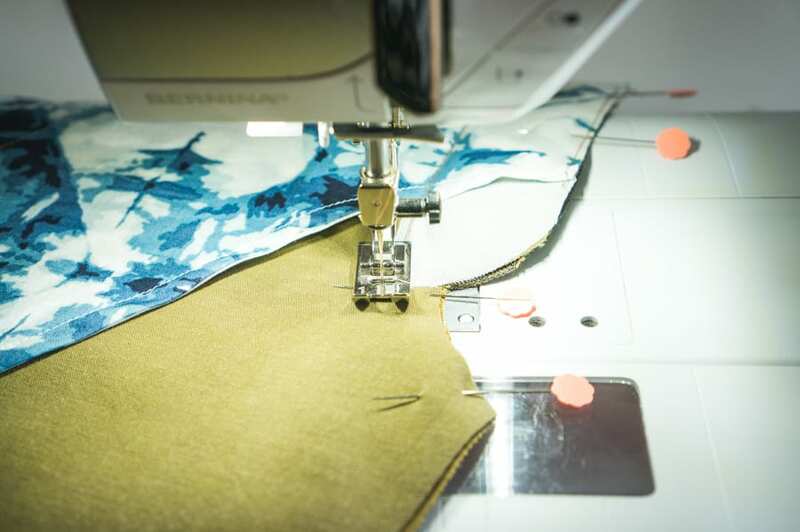 When you get to the bottom, you can even disengage your knife to be extra sure you won’t cut into your fabric if your machine allows you to do so mid-stitch. 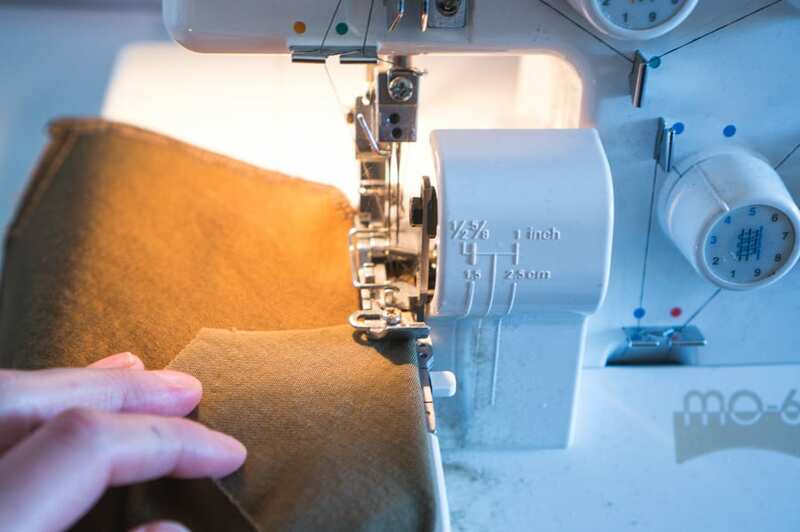 Weave the tail of the serger thread into the stitching along the bottom of the fly extension so it doesn’t unravel later. 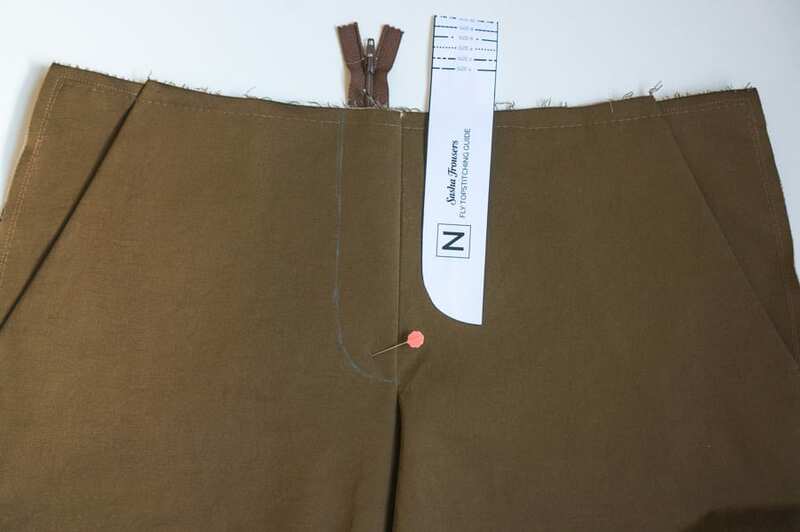 Pin the right and left front trouser legs together along the edges of the fly extension and crotch seam. 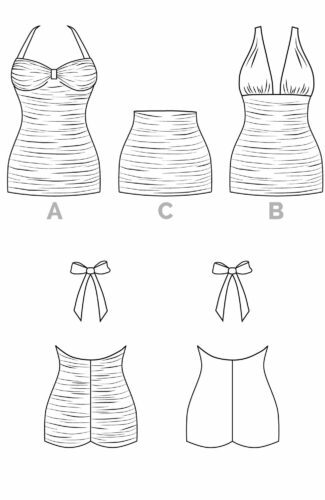 Draw a straight stitch line from the top center front notch to the circle marking at the beginning of the crotch seam. 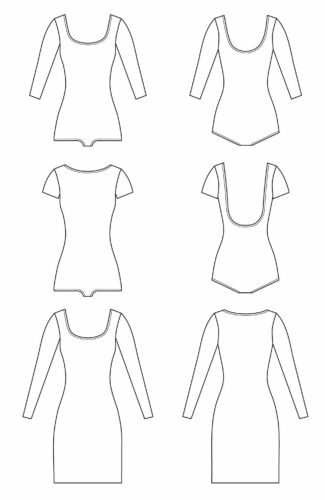 Sew a long basting stitch along the straight stitch line you drew. 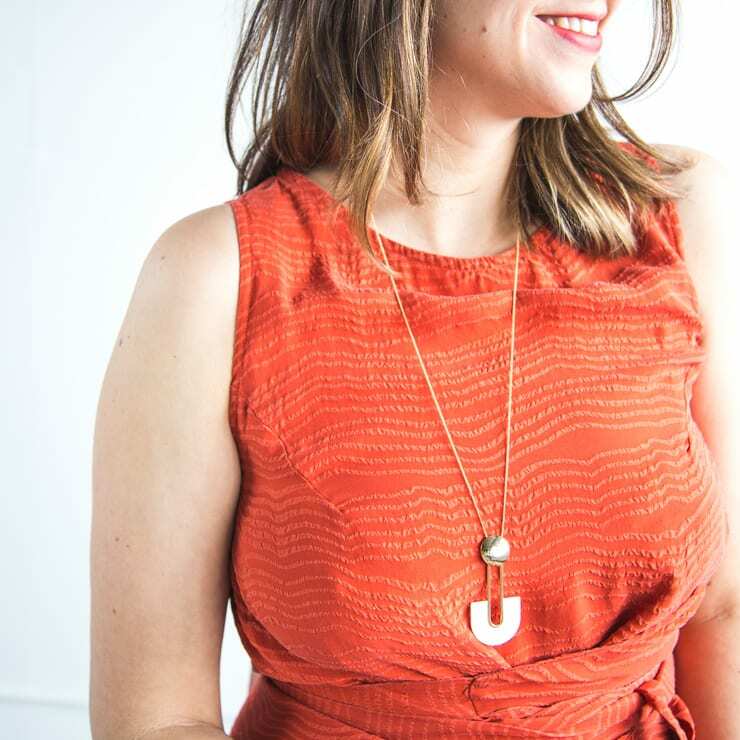 When you reach the circle marking, switch to your regular stitch length and continue sewing along the crotch seam at 5/8″ seam allowance. Make sure to backstitch a few times at the circle before continuing to the end of the seam. Snip from the bottom corner of the fly extension to the circle marking, without cutting into your stitch line. 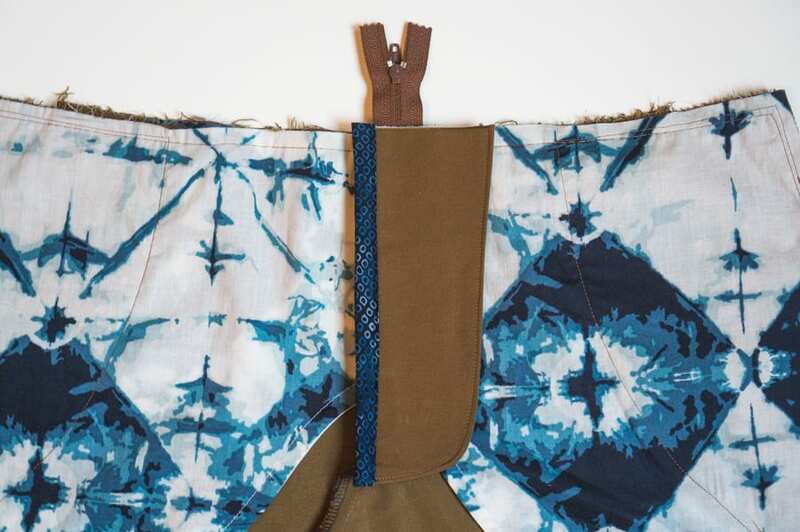 Serge the crotch seam and pull the tied loose thread tail through the seam to secure. 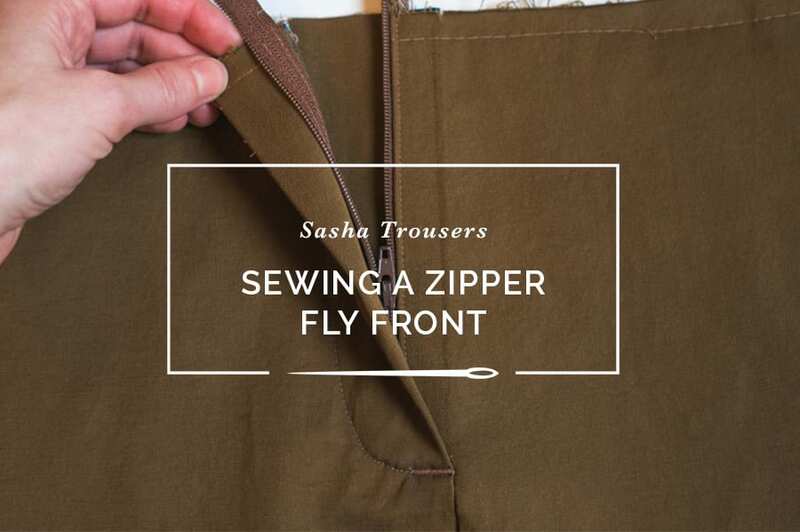 Press the fly extension open and the crotch seam to the right (ignore the photo below; the seam should be pressed to the right leg). 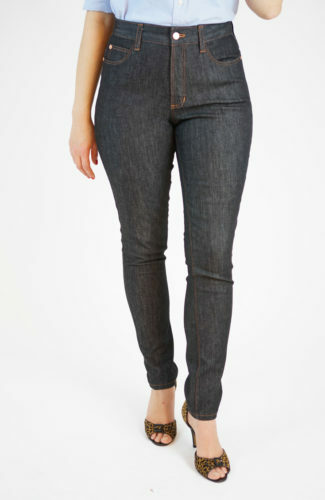 With the wrong side of the pants facing up, lay your zipper on the left fly extension with the teeth facing down. 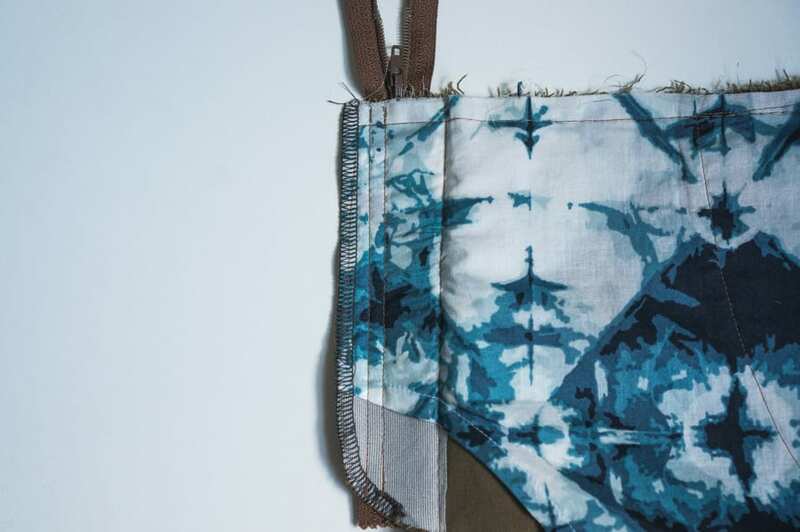 The right edge of the zipper tape should align with the center front seam, and the bottom of the zipper stop should rest at least 3/4″ from the bottom of the left fly extension. If the zipper is positioned correctly, the actual edge of the zipper teeth should be about 1/2″ away from the center front seam. Pin in place. 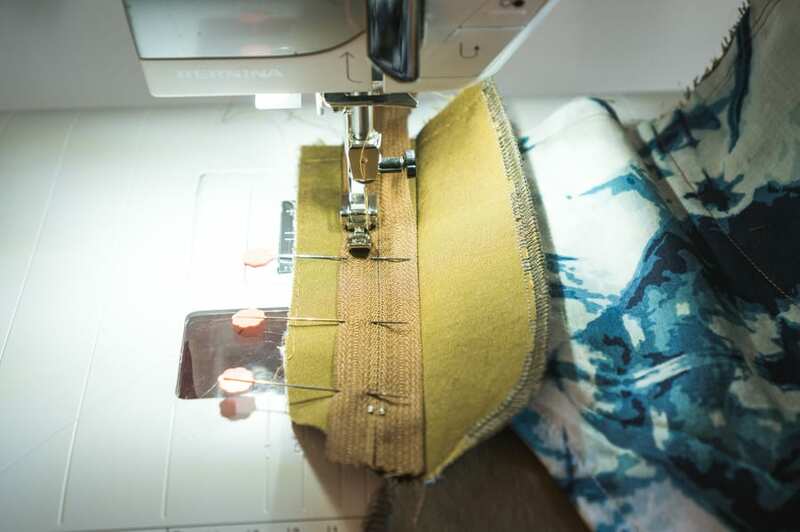 Switch to a zipper foot and sew the left side of the zipper to the left fly extension. 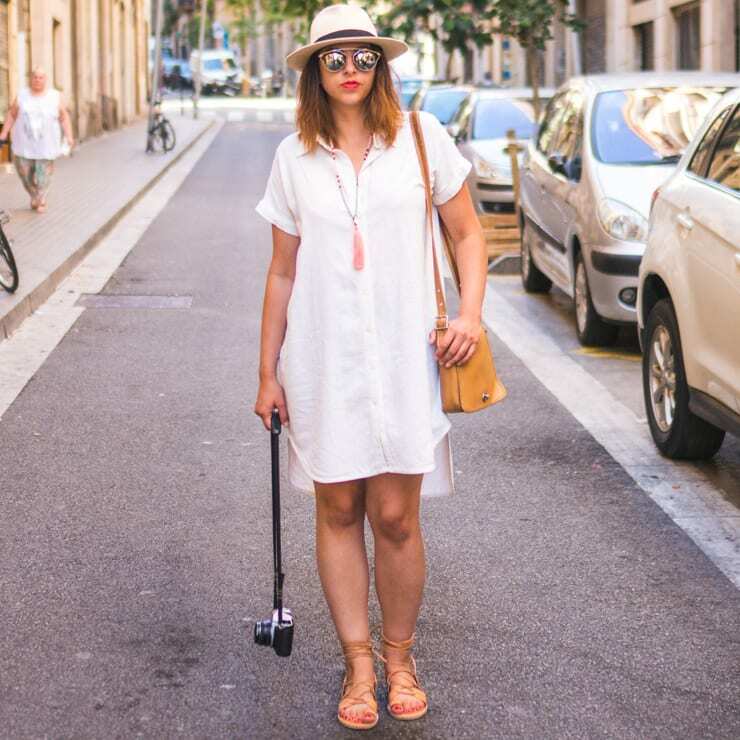 Keep the left pant leg tucked out of the way! 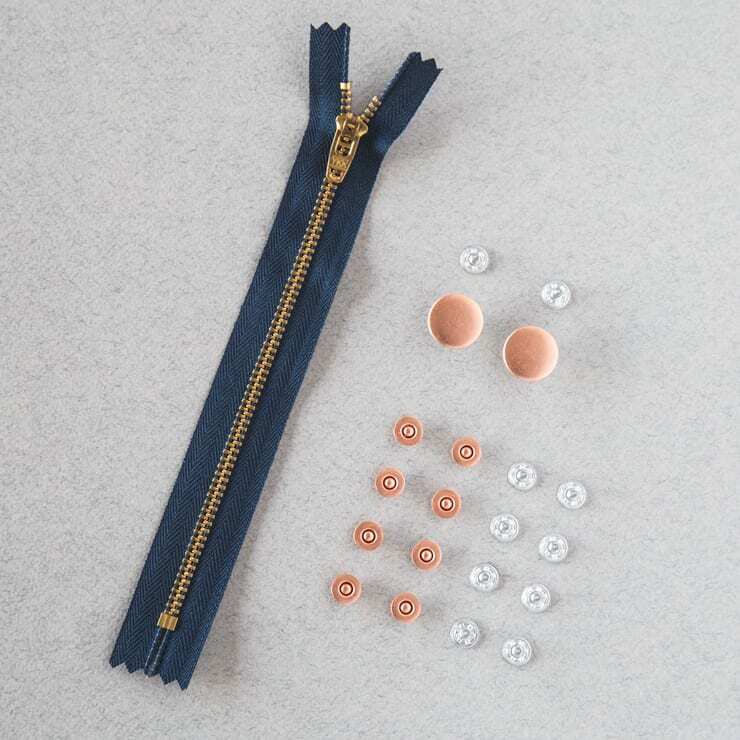 Sew the zipper to the fly extension only. 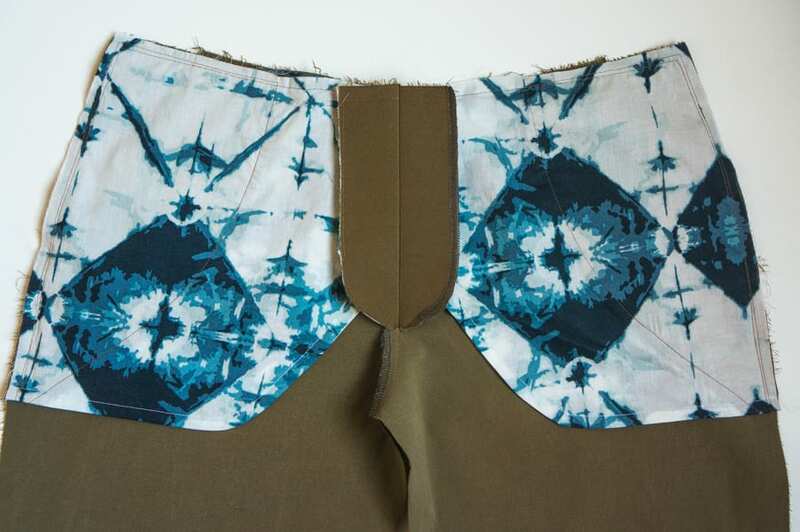 Turn the zipper right side up, folding the left fly extension under the seam you sewed. 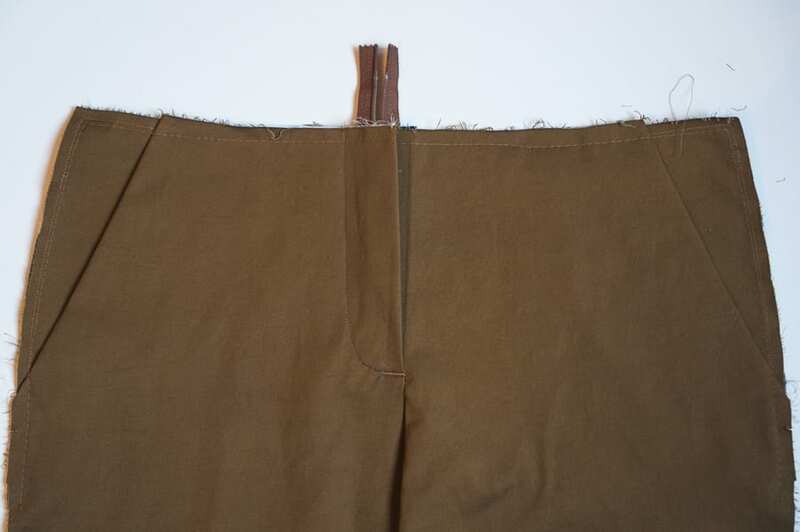 Topstitch 1/8″ to the right of the zipper, keeping the pant legs out of your stitch line. 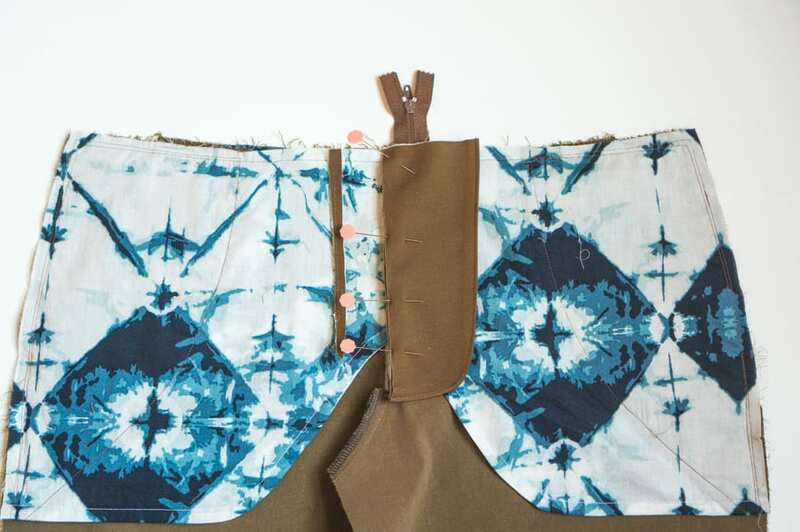 Now flip the zipper and left fly extension to the right of center front. 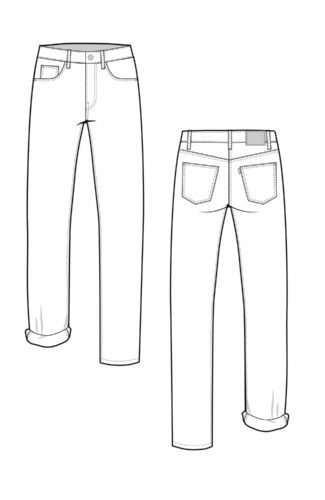 The left fly extension will be resting on top of the right fly extension, and the zipper will now be to the right of the center front seam. Pin the right side of the zipper to the right fly extension, keeping the pant legs out of the way. 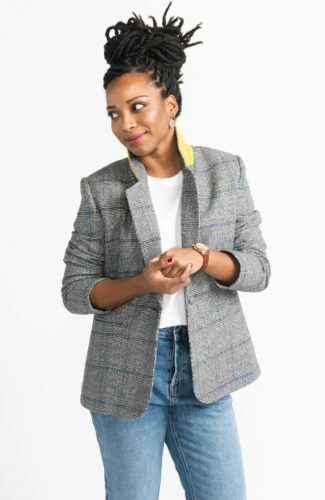 Turn the front of the pants over so the right side is facing up. 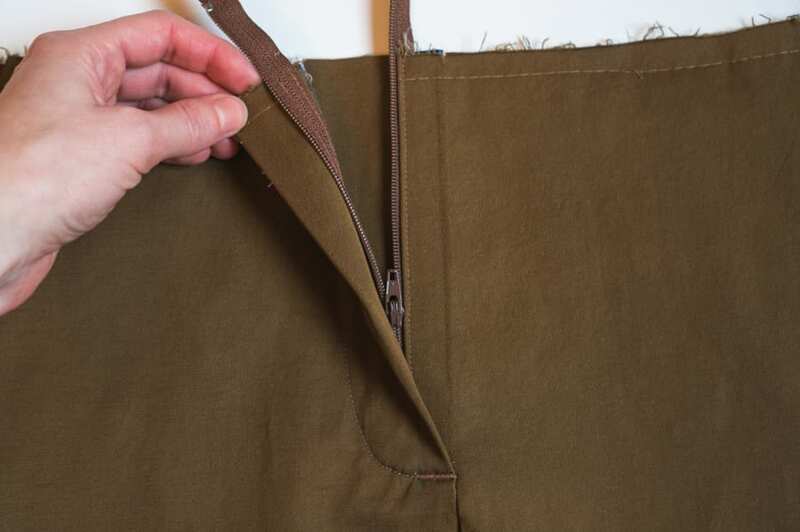 Locate the bottom zipper stop with your fingers, and place your topstitching guide about 1/2″ below it with the straight edge of the guide along the center front seam. 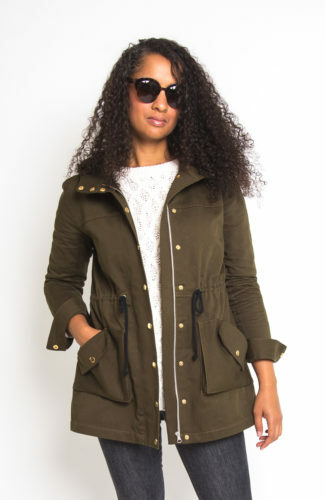 You want to make sure you are catching the fly extension below, while also avoiding sewing over the zipper stop, so adjust as necessary until you get the positioning right. With a removable marking tool, trace your stitch line along the curved edge of the topstitching guide. 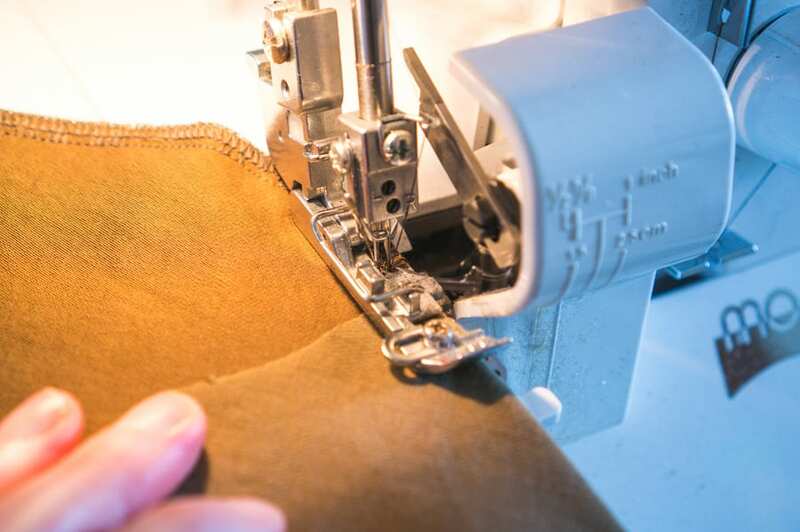 With your regular machine foot, topstitch along the traced stitch line. To achieve a smooth curve, go slowly and readjust your position every couple of stitches. Backstitch when you reach the center front seam. Prepare the fly shield for installation. 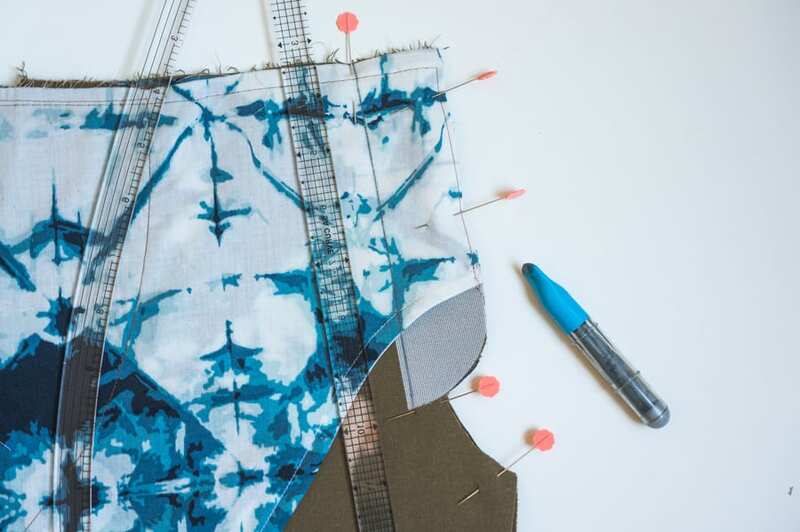 It doesn’t matter which of the fly shield pieces is interfaced, but we prefer to interface the outer shield since it will be resting against the zipper. 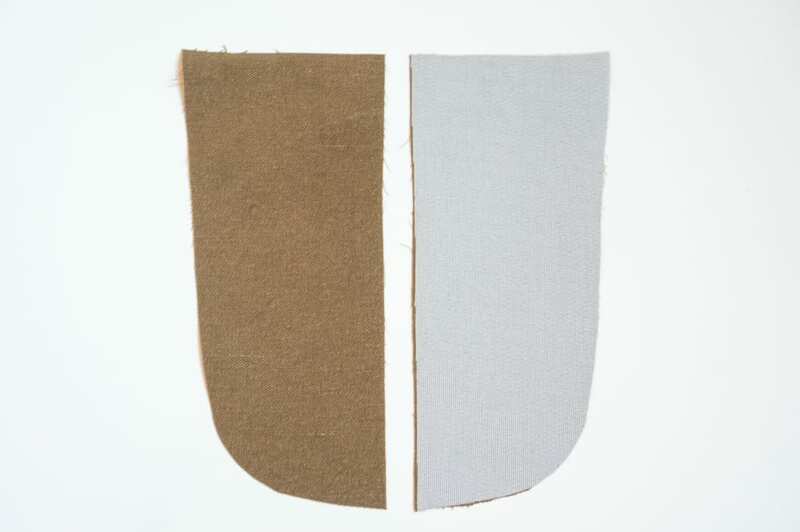 With right sides together, sew the two fly shield pieces together along the curved edge at 5/8″. 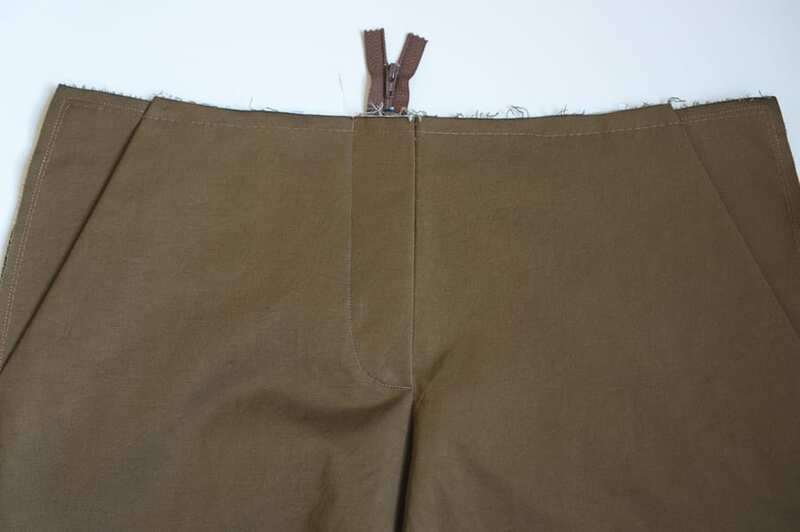 Trim down the seam allowance and clip the curve. Turn the fly shield right side out and press well. 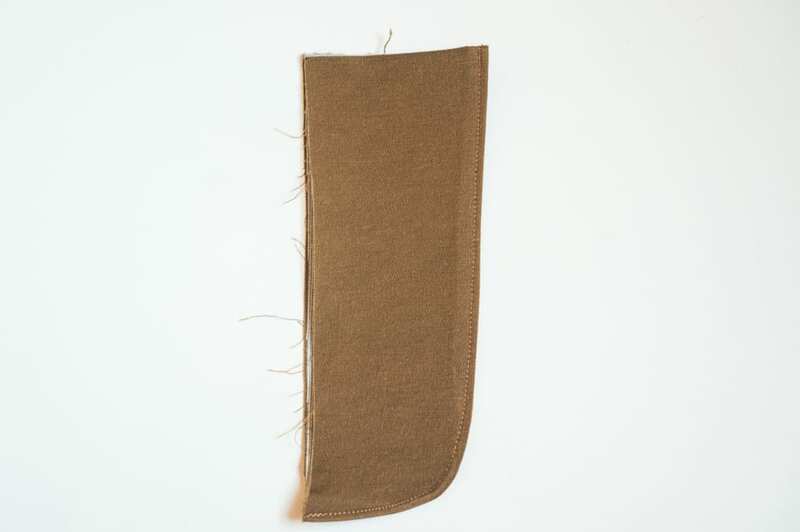 Topstitch 1/8″ around the curved edge. 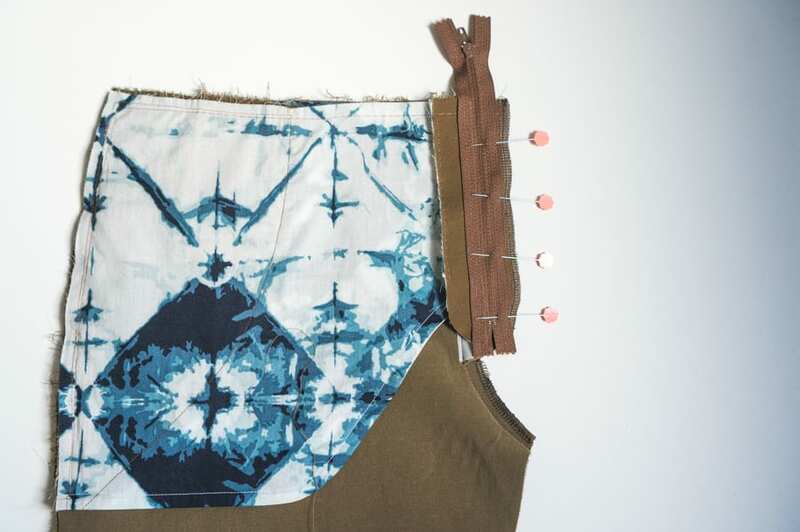 To position the fly shield in place, place the straight edge of the fly shield over the left fly extension, and align the top of the fly shield with the waist of the pants. Pin the fly shield in place so that when it is sewn with a 1/4″ seam allowance, the stitch line will just catch the left zipper tape. 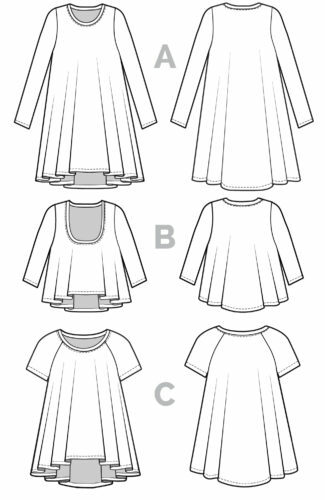 You will need to trim some excess fabric from the left fly extension. 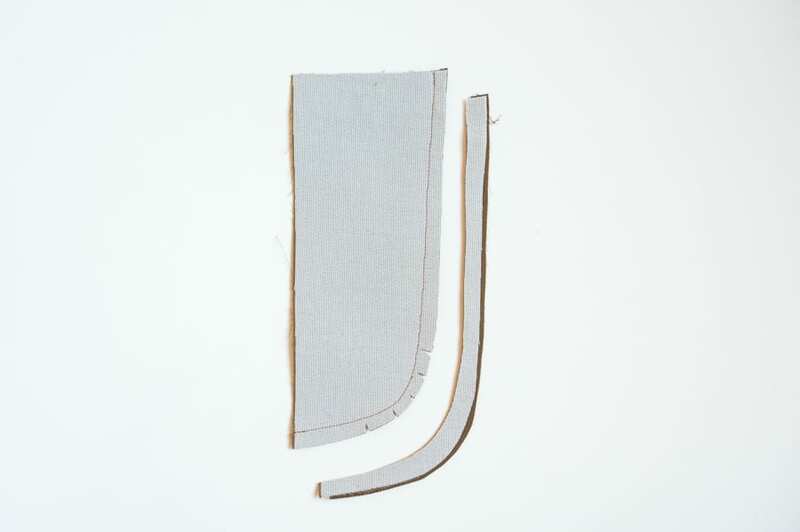 After the fly shield has been sewn in place to the left fly extension using a 1/4″ seam allowance, finish the raw edge. 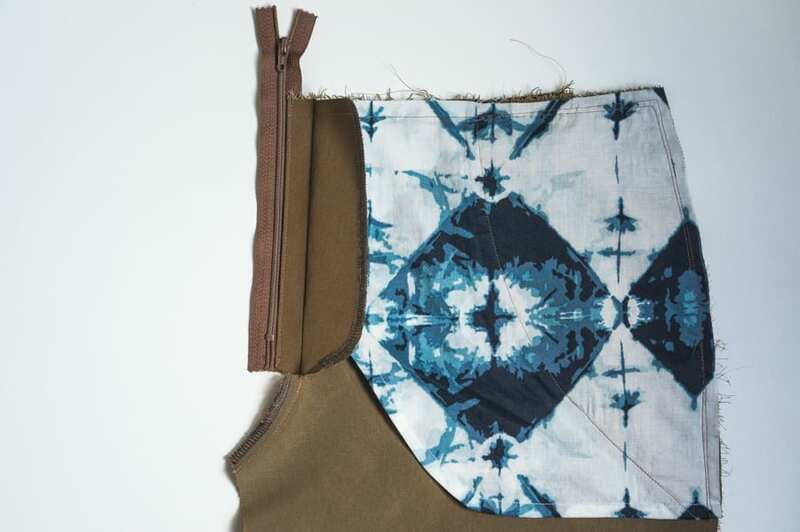 You may use a serged or zig-zag stitch, or finish the seam with bias tape. 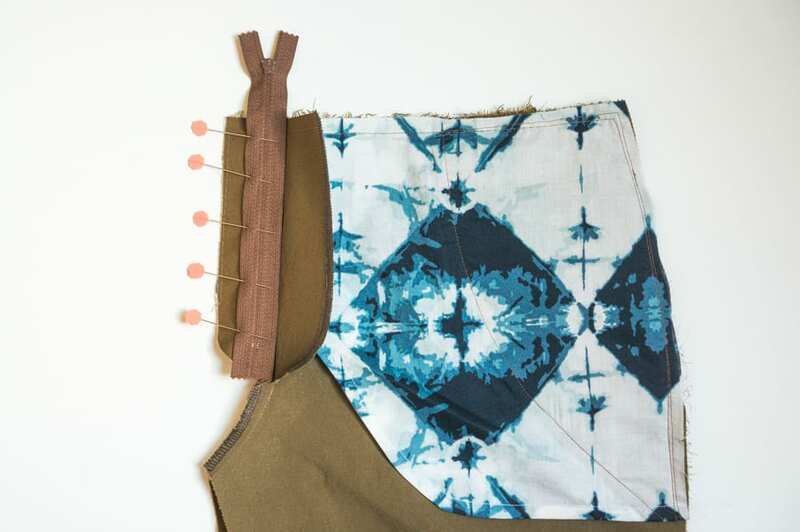 To secure everything in place, sew a 1/2″ bar tack at the bottom of the topstitching where it meets center front. 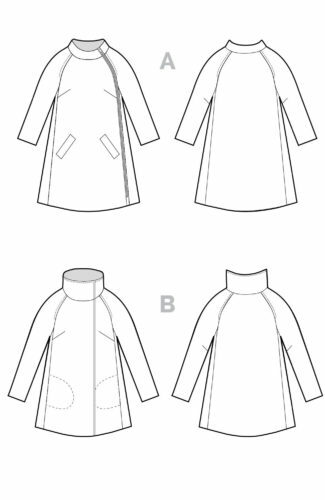 Begin sewing at center front and sew through all layers. The fly shield will now be anchored stay in place. If you haven’t done so already, remove the basting stitches along center front and test your zipper! 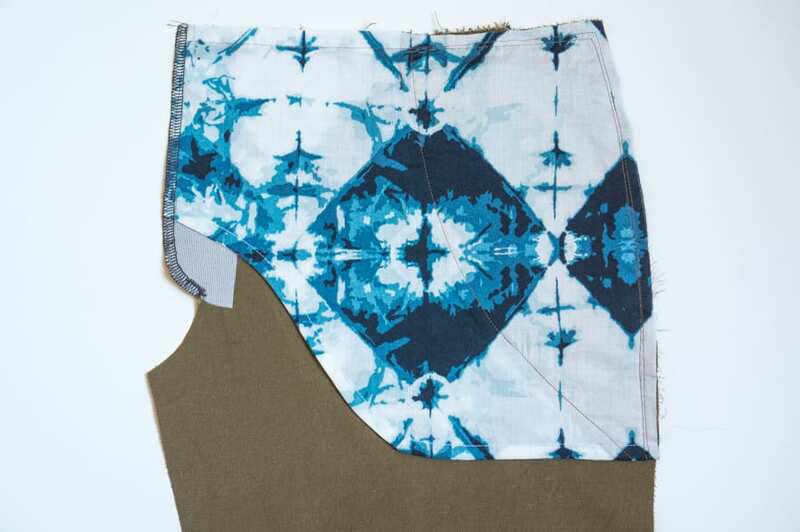 The front and back of your trousers are now ready to be sewn together! 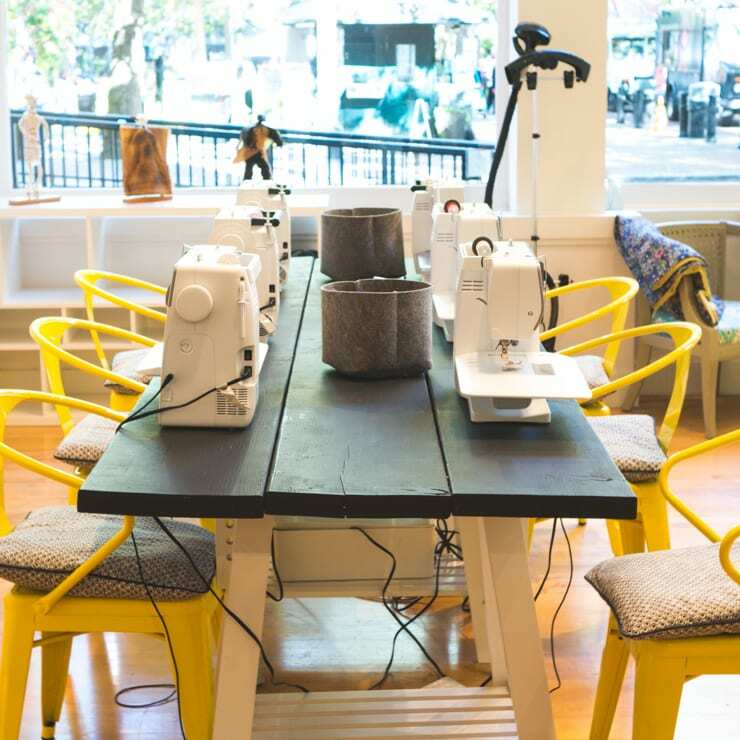 We recommend taking the time to baste your legs together before permanently sewing everything together. 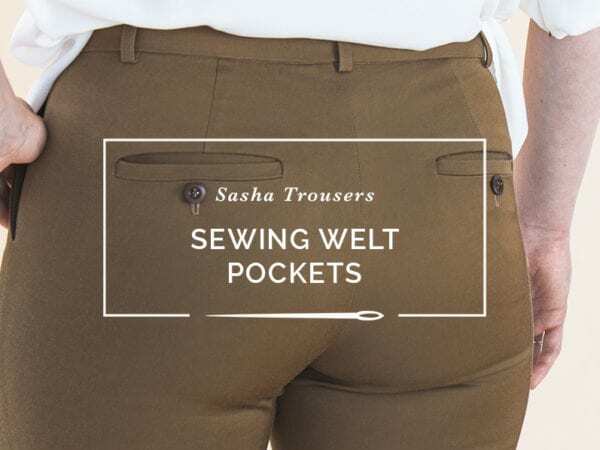 Check out our post on fitting tips for the Sasha Trousers, and then check back for our upcoming waistband tutorial.